When you want to repaint your home, whether the old paint is outdated, or you recently moved and are not a fan of the former owner’s preference, there are many colours, paint, and sheen choices for you to choose between. Painting is both a quick and cheap way to vastly improve your space, neutralize smells that have seeped into the walls, and make your home more sellable if you are going to be putting it on the market. But how do you choose the right paint? Here is a guide to help you make your decision a little bit easier. When you are picking paints, there are two choices: oil and latex. Latex is superior for most applications. It is highly durable and easy to clean up. It is also fade resistant and has excellent breathability which helps to cut down on blistering (which looks exactly as gross as it sounds). Oil paint is great for real wood trim though, as it helps to protect the wood from stains. There are so many colours on the market that it can be challenging to pick, especially if you don’t have great colour vision. What you choose depends a lot on what you are going to be doing with your home. If you are going to be moving then go with neutrals, especially whites and off-white is the best bet. You cannot please every potential buyer so going with something neutral that they will be able to live with when they move in is ideal. If you are painting for yourself, then you have a lot more freedom. If you are having trouble choosing, then you can use the colour wheel to help you pick colours that compliment one another. There are also recommendations on paint websites that show you what paints look like and which other paints go with them, though you should always look at swatches in person. Think about if you want an elegant look, a vibrant look, or a soothing look. If you are looking for elegant, go with a neutral like white, beige, browns, and greys or something rich like burgundy. If you want something vibrant, then you should go with deep reds, oranges, and bright greens. For soothing colours stick with more grey toned teals, soft yellows or greys, or lavender. There are different sheens to every paint that work best in different rooms. While the names of sheens can change paint company to paint company they usually are along the lines of flat, matte, eggshell enamel, satin enamel, semi-gloss enamel, and hi-gloss enamel, listed from no shine to high shine. Matte paint sheens are best for low-traffic areas, but it does touch up well and hides surface imperfections. Matte is best in family rooms, living rooms, bedrooms, bathrooms, and on ceilings. Higher gloss enamel resists dirt and is easier to clean, they are good all around paints, but the highest gloss enamels should be used only on trims, doors, shutters, and cabinets. Paint is hugely personal and can really change the look and feel of your room. 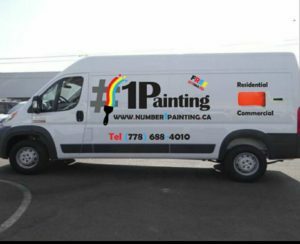 If you want to have your house painted and want the job done right then contact us at Number 1 Painting. We are painters in Coquitlam who offer great prices for a great product. Contact us today!